What's that you say? We're less than two days from Christmas and you still haven't figured out what to get for Aunt Mildred. Or Grandpa Eddie. Or your sweet little niece and nephew? You love handmade gifts but have run out of ideas and you might just buy a gift card. 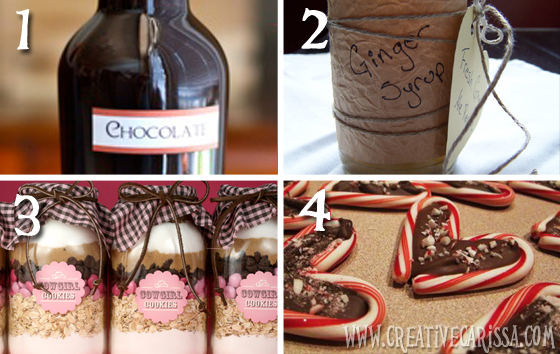 Before you run out and drop your hard earned cash on a piece of plastic check out these great gift ideas that you can make (even last minute), sometimes even with things you already have on hand. You'll be able to give a clever handmade gift and look super thoughtful doing it. 1. Homemade Chocolate Syrup from Small Notebook. Most chocolate syrup bought in store is full of ooky mystery or genetically modified ingredients. I love that you know everything that goes into this one and it's a gift any mocha drinker or parent of children who drink chocolate milk will appreciate. 2. Homemade Ginger Syrup (my recipe). This is super easy to make and is also easy to make in large batches so if you need to make a gift for several people, you can crank out several bottles of this with less than an hour of hands on time from you. 3. Cookie Mix in a Jar from Bakerella. This is another one that would be great for making in multiples. Just set everything up assembly line style and crank out a dozen in an afternoon. 4. Candycane Hearts from In His Grip. These look easy enough to make and would be a fun project to involve kids with, whether it's dolloping chocolate or sprinkling crushed candy canes on top. If you have a stoneware cookie sheet, make these even faster by freezing your stone for a a few hours and then making the hearts on parchment paper placed on top. This will set the chocolate even faster. 1. Framed Art & Artist Photos from Southern Exposure. Let your kids create a masterpiece and snap a photo while they're doing it. Frame both together and you've got a winning combination! 2. Thumbprint Holiday Cards from Meet the Dubiens. Pair one of these with a store bought gift to add a personal touch. 3. Personalized Candles from A Girl in Paradise. 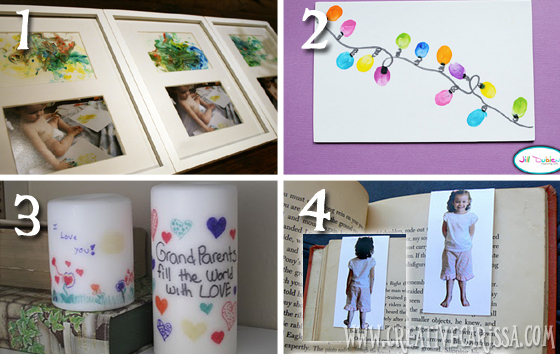 Let your kids draw or decorate a design that you transfer to a candle with a little help from a grown up. 4. Front and Back Bookmarks from Having Fun at Home. Snap some pictures of your kiddo(s) from both sides, upload to a site like Shutterfly or Walgreens that lets you swing by to pick up the pics later and you've got a fun meaningful gift that will be used by a bibliophilic grandparent. 1. Mustache Binkies (my project). They only take minutes to make but they are tons of fun for both kids and grown ups. 2. Tool Belt or Art Apron from Outnumbered. Nikki writes a great tutorial for making a tool belt for play toys. You could also follow the same tutorial to make an art apron that crayons or markers fit into. 3. Personalized Board Book from Chef Messy. 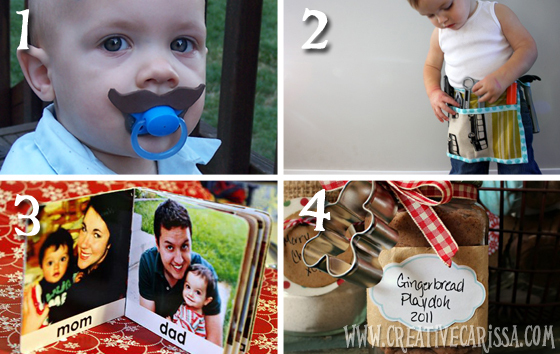 Raid your photo archives or scan facebook for photos of family members to make a personalized board book. If you don't already have a spare board book lying around, check out Dollar Tree as they frequently sell two-packs of small board books for $1. 4. Gingerbread Playdough from The Sweet Adventures of Sugarbelle. 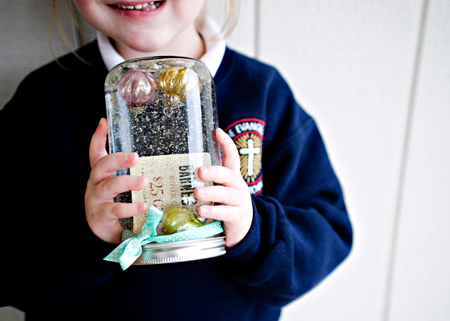 Whip up a large batch of heavenly scented non-toxic playdough for all the kiddos in your life using ingredients you already have in your pantry..
At the end of the day if you decide to give a gift card anyway, you can always give it a festive DIY touch by packaging it in a fun snow globe using this tutorial from The Creative Mama. Thanks, Carissa! It's fun to be included in this great compilation! Thanks for including one of my projects in your post! There are a lot of great ideas here. Merry Christmas! Thank you so much for including my project in your post. I can't wait to try your Homemade Ginger Syrup. Looks yum! Comments make me happy! Thanks in advance for sharing your thoughts. I miss you! Please come back to me! I am a participant in the Amazon Services LLC Associates Program, an affiliate advertising program designed to provide a means for sites to earn advertising fees by advertising and linking to amazon.com. This post may contain affiliate links to products on Amazon. I promise to only ever link to products I genuinely recommend. 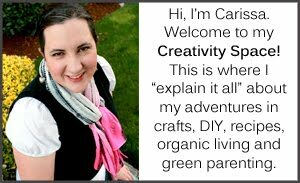 Thank you for supporting Carissa's Creativity Space.